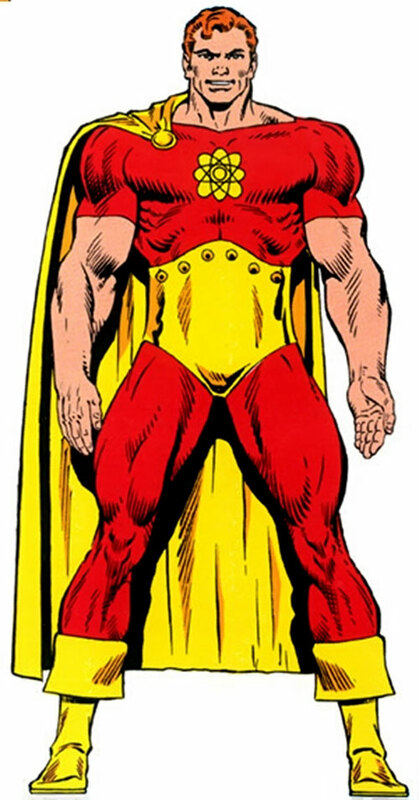 Marvel Comics has had numerous versions of Hyperion. This profile is about the one who appeared in 1975, and later starred in Squadron Supreme – one of the landmark super-hero comics of the 1980s. He comes from another version of Earth, often nicknamed “Earth-S”. Hyperion is absolutely an expy for DC Comics’ Superman, and usually associates with other characters who are clear equivalent of DC ones. He’s thus the great, virtuous and incredibly powerful lead super-hero of his Earth and matches many Superman story beats. Alter Ego: Zhib-Ran, Mark Milton. Marital Status: Single (dating Power Princess). Known Relatives: The Miltons (foster parents, deceased), The Eternals of Earth-S.
Group Affiliation: The Squadron Supreme. Base Of Operations: Cosmopolis, Squadron City, the United States of America. Height: 6’4” Weight: 460 lbs. Eyes: Light blue. Hair: Light orange/blond. Hyperion possesses a host of superhuman powers. In fact, he is the most powerful man on Earth-S, and possesses superhuman strength, great speed, as well as near-total invulnerability. Hyperion can also levitate himself by mentally manipulating gravitons around himself. Through concentration, Hyperion can project beams of discrete energies from his brain (generated by the quasi-nuclear reactions in his body) through the optic nerves of his eyes. This atomic vision or nuclear vision is capable of generating radioactivity in the X-ray range of the electromagnetic spectrum. 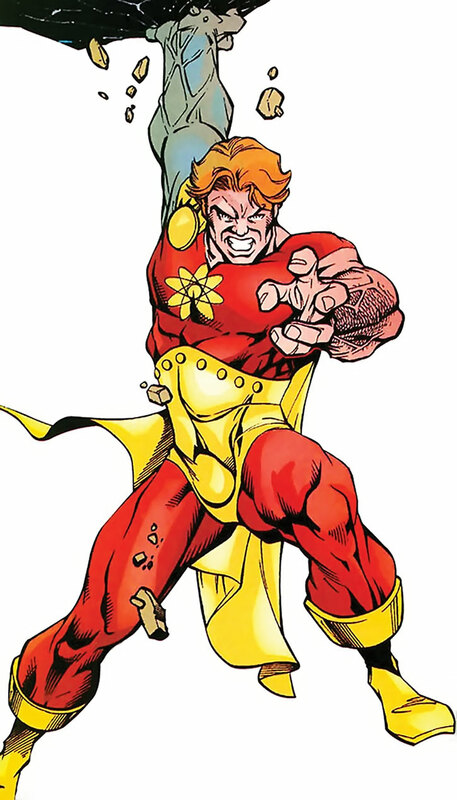 His atomic vision can also generate heat, with a maximum power output of approximately 12,000 degrees Fahrenheit, depending on the spread of the beam, in the infrared portion of the electromagnetic spectrum. Ordinarily, Hyperion’s atomic vision did not harm his own eyes when he projected it. However, the expenditure of tremendous amounts of energy (such as those generated during the battle with his doppelgänger) will severely injure Hyperion’s eyes, rendering him blind. He radiates power on a super-human level and inspires admiration and respect wherever he shows up. Hyperion thus has a strong, influential personality, is a great leader and a good public speaker; a true world changer and leader. Hyperion’s principal weakness is an isotope of lead called Argonite whose particles of decay serve to damper the quasi-nuclear reactions in his body. While in itself it cannot kill him, it can render him susceptible to other forms of injury (Nighthawk once planned to assassinate Hyperion using a bullet made of argonite). Presumably its presence would weaken Hyperion enough so that the bullet could penetrate his body. 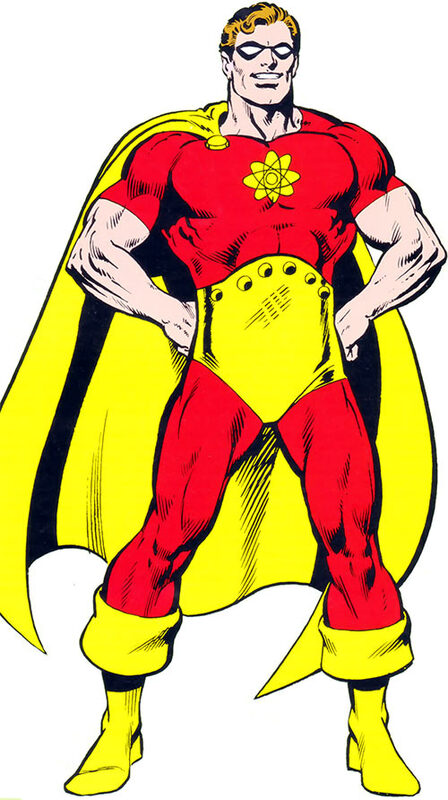 Hyperion wears a bright red skin-tight costume with his muscular arms uncovered, yellow boots and something resembling a golden girdle. 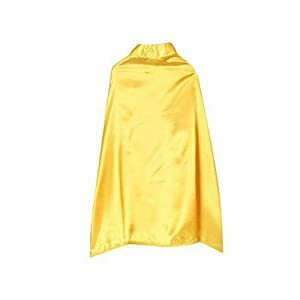 To add to the mighty impression he wears a yellow atom picture on his chest (a Bohr model of Beryllium to be exact) and a rather large yellow cape. Earlier he also wore a black eye mask à la Nightwing, during his Utopia days he wore no masks and during his blind days he wore the Image-simulator resembling technological green sunglasses. Hyperion is a cheerful and good man, abandoning all personal interests to protect and maintain the world and the Squadron. Often he is seen with a smile on his face though the impression he often gives is the serious one. Hyperion believes in might makes right and thus he proposed the totalitarian Utopia-program. He also possesses an iron will with no equal. He will not kill an opponent and usually he is very careful with this, but if the Earth is heavily threatened he will resort to killing. Although almost having abandoned all personal interests previously, he recently has become a couple with Squadron member Power Princess, the only other person on Earth near his own power level. During his entire life he was taught by his parents not to use the full extent of his abilities. He has since overcome this thinking and will instead often use his abilities to their fullest, with the only exception in combat with human beings. Hyperion’s origin has always been a great mystery and discomfort to him, but recent revealing has enlightened that situation to his relief. He is also a competent leader and an able public speaker. As long as the motives are clear he will never bend nor break, but fight the ’never-ending battle‘. 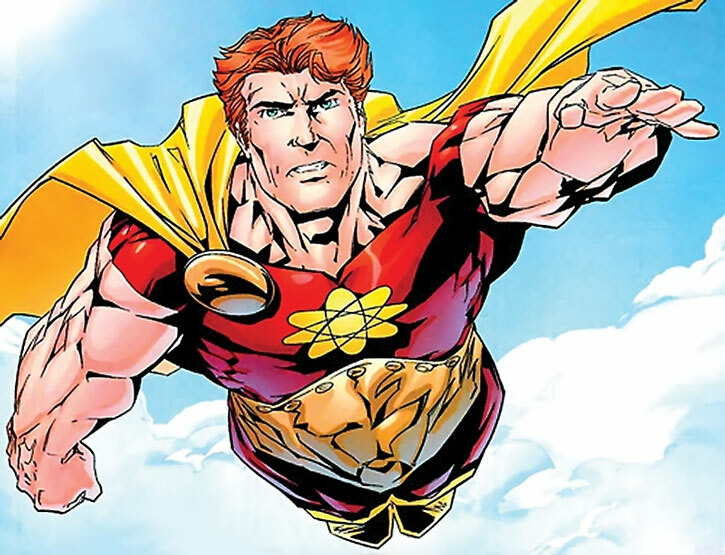 Hyperion is actually a Superman copy almost at his power level. 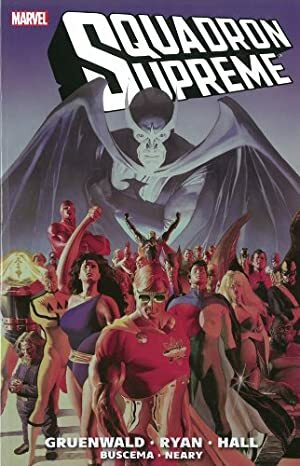 In the DC Universe the Squadron Supreme could be alternates of the Crime Syndicate, and originate from a DCU Counter-Earth. A team could get caught between the two teams fighting over the PCs’ world, both wanting to control it in different ways. Cue lots of moral dilemmas ! Energy Blast causes radiation damage – but it ignores Sealed Systems (+2) (it also ignores Skin armor and Flame immunity as usual) – although Energy Absorption still works against it, as demonstrated by Master Menace. Energy Blast has a Minor Power Burnout (-1) – if Hyperion is Pushing his Energy Blast at that point, he also becomes permanently blindt (-1). The effects are seen only after Energy Blast itself has been turned off and when this occurs Hyperion receives the CPR (Blind) drawback and effectively loses all sight capacity. Hyperion wasn’t aware he had this Limitation until it struck (it struck fairly late, as he wasn’t using his Energy Blast much) ; he has since bought it off as Makkari taught him to use his energy vision properly. Energy Blast originates from his eyes only and takes one Automatic Action or one Dice Action to activate or deactivate (GM’s discretion; 0 or -1). Energy Blast is its own AV (+1 or +0 depending on house rules). Even though it has been revealed that Hyperion is an Eternal he has so far not shown all of the powers of the typical Eternal. It seems possible that he could develop the abilities to join the Uni-Mind and several other psionic abilities. Feel free to add these if it feels right or if this is revealed in comics. Area Knowledge (United States of America), Credentials (Government and Military – High), Expansive Headquarters (Satellite, Squadron City), Leadership, Popularity, Immortality. Makkari (Low), Quasar (Low), Squadron Supreme (High), US Government (High). CPR (Blind, earlier only), Forced Exile (Earth-S), Secret Identity (Public earlier), Loss Vulnerability (Argonite, 3 APs, All Powers and Physical attributes), Oblivious. Image-simulators [BODY 04, Bonus: Decreases the severity of Hyperion’s CPR (Blind) to MPR (Bad Sight) while worn, R#3, Special: R#3 leads to SPR (Half-Blind), while R#2 leads to CPR (Blind)]. An alarming number of the adventures of the Squadron Supreme revolve around the concept of mind control. In many of these adventures, most of the Squadroners succumb to such trickery, at least for a while, where many believe that, for example, the Avengers would not have succumbed under those conditions. There is no reason why all the Squadroners would be more susceptible towards mind control, so the reason for their weakness probably lies somewhere else. The reason for their weakness has been said to be their arrogance. It is suggested that under the genre that the Squadron usually operates, all mind control attempts (i.e. use of Powers such as Control or Broadcast Empath) are at -2 CS OV/RV as long as the subject lacks humility. If the subject harbors thoughts of taking control of his environment on a massive scale (more than a hundred persons, roughly) his desire to control becomes, in that Genre at least, easy to twist into extreme actions and an escalating delirium. – Prowess — Enhanced Strength 16, Enhanced Stamina 15, Enhanced Agility 5, Enhanced Dexterity 5, Enhanced Fighting 8. – Power Lifting — Enhanced Strength 4, Limited (Lifting Only). – Life Support — Immunity 11 (Aging, Life Support). – Invulnerability — Impervious Toughness 16. – High Density — Feature (double weight of normal human of his stature), Protection 2. – Keen Senses — Senses 2 (Extended and Tracking Hearing). – Fast Healing — Regeneration 1. – Flight — Flight 16. – Fast Running — Speed 4. – Fast — Quickness 6, Enhanced Advantage (Improved Initiative), Enhanced Dodge 9, Enhanced Parry 6, Enhanced Advantage (Close Attack 10, Ranged Attack 6). – Broad Spectrum Vision — Senses 5 (Ultravision, Vision Penetrates Concealment). – Eye Beams — Ranged Damage 14, Accurate, Activation (move), Variable Descriptor (radiant energies). All-Out Attack, Close Attack 10, Improved Critical (Eye Beams), Improved Initiative, Inspire, Leadership, Power Attack, Ranged Attack 6, Ultimate Effort (Toughness). Benefit 2 (Popularity), Beneft (vast resources, as Squadron member), Connected. Deception 6 (+10), Expertise (Artist) 4 (+7), Expertise (Science) 7 (+10), Insight 6 (+11), Intimidation 6 (+10), Perception 6 (+11), Persuasion 6 (+10), Ranged Combat (Eye Beams) 9 (+20), Technology 7 (+10). Upholds Good Hyperion does what he believes will do the most good to the most people. Public Identity His real name and various aspects of his life are generally known. Previously, he had a secret identity. Forced Exile Hyperion is actually a member of a race like the Eternals. He has also been stranded on alternate Earths on a number of occasions. Vulnerability (Argonite) Proximity to the lead isotope Argonite causes a loss of all his powers, including a drastic reduction in his physical capabilities. Blindness Side Effect (previously) Energy Blast had a Complication that Extra Effort could make him blind (this had a 50% chance of happening any time he was using Power Attack or scored a critical hit while using Extra Effort to increase his damage). The effects are seen only after Energy Blast itself has been turned off. Hyperion wasn’t aware he had this Complication until it struck (it struck fairly late, as he wasn’t using his Energy Blast much); he has since lost this complication as Makkari taught him to use his energy vision properly. Makkari also helped him use his healing abilities to restore his vision. Trade-off areas Attack & Effect PL 18, Dodge/Toughness PL 17, Parry/Toughness PL 17, Fort & Will PL 15. Point total 326. Abilities 30, Defences 9, Skills 29, Powers 249, Devices 1, Advantages 9. Equiv. PL 22. If using the optional uncapped benchmarks, he replaces Power Lifting with 5 more ranks of Enhanced Strength (Damage 22), Energy Blast increases to 15, and his Stamina becomes 19 (raising his Fortitude to 19 and increasing his Toughness to 21). Trade-off areas Attack/Effect PL 21, Dodge/Toughness PL 18, Parry/Toughness PL 18, Fort/Will PL 16. Point total 326 Abilities 30, Defences 9, Skills 29, Powers 250, Advantages 9. Equiv. PL 22. Helper(s): John Colagioia, Nick Yankovec, Frank Murdock, Hart, Sébastien Andrivet, Pawsplay. DCA stats by Pawsplay. Source of Character: Squadron Supreme comics, Marvel Universe.